Plan Bay Area, the 25-year regional development and transportation funding strategy, was approved by the Metropolitan Transportation Commission and Association of Bay Area Governments last night. The commissions passed a plan that includes some highway expansions and won’t meet the region’s own goals for sustainable transportation, according to projections, but which nevertheless represents a step forward for smart growth. The meeting ran past midnight after about five hours of public comment. Some spoke in support of the plan, while others urged commissioners to approve an alternative draft that would take stronger measures to encourage transit-oriented, affordable housing. Most commenters, however, decried the plan as a fundamentally “totalitarian” imposition on property rights, defending the status quo of car-dependent suburban development patterns as “organically grown” communities. As the Greenbelt Alliance and the Marin Independent Journal have reported, some conservative groups rented buses to haul in folks to rail against the plan. Much of their rhetoric smacked of Agenda 21 conspiracy theories. Georgine Scott kicked off the public comments by reading off a notice she had drafted, declaring that she could seize the assets of the MTC because Plan Bay Area is a violation of the constitution. Not everyone held the belief that planning for a less car-dependent future constituted a conspiracy to deprive people of their property rights. When Joseph Turner, who identified himself as a senior from central Contra Costa County, bemoaned having to drive to a BART station to come to the meeting, “polluting all the way,” some in the audience booed. When he added at the end of his comment that he’d like to “give up the car and help save the planet,” many more applauded. Overall, Plan Bay Area was lauded by land conservation advocacy groups like the Greenbelt Alliance and the National Resources Defense Council. The plan will “create communities where drives to your day-to-day needs will be shorter, or you may not even have to drive at all,” said NRDC’s Justin Horner. It is the only [Sustainable Communities Strategy] so far that includes all of its planned development within the current urban footprint. That means no new sprawl in the Bay Area for the next 30 years. The SCS not only meets its greenhouse gas emissions targets, but exceeds them. It is the only SCS that includes specific funding and programming for the preservation of open space. The SCS includes funding for an ambitious expansion of a suite of transportation innovations, including carsharing, commuter incentives for transit, and the expansion of electric vehicle charging infrastructure. As the SF Public Press reported this week, even though vehicle emissions under Plan Bay Area are estimated to be reduced by 15 percent on a per capita basis by 2035, emissions would still grow by 9 percent overall. Similarly, traffic crashes are still projected to rise by 18 percent by 2040 (while decreasing by 10 percent per capita). The plan would fail to meet several other regional targets set by MTC. While MTC and ABAG didn’t adopt the bolder “Equity, Environment and Jobs Alternative,” which was drafted by the MTC along with sustainable planning advocacy groups, TransForm said that several amendments passed by the MTC “helped address our concerns.” The EEJ alternative would have ditched plans to expand highways with high-occupancy toll lanes and done a better job of reducing housing and transportation costs for low-income residents. An amendment introduced by Supervisor Scott Wiener, who sits on the MTC, proposed adding language to help ensure a certain percentage of revenue from California’s cap-and-trade program would go toward transit capital projects and vehicle rehabs. But the percentage-based requirement was removed after encountering opposition from other commissioners, and the amendment was changed to only state that a “significant amount” would go toward transit. At the request of Supervisor David Campos, who also sits on the MTC, the amendment also specified that the funds could also go toward transit operations. 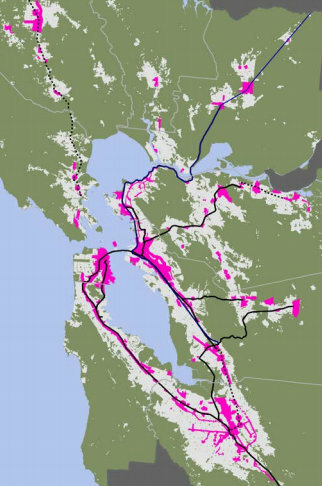 Despite the shortcoming and remaining challenges in Plan Bay Area, such as securing funding for transit, walking, and biking projects, sustainable planning advocates see it as an unprecedented step toward ending the era of car-dependent suburban sprawl in the region. My favorite part of this is that they chartered buses to bring people in – to avoid parking hassles! Nothing like using high-density transportation to rail against the promotion of high-density growth! You laugh now, but wait till Obama implements Agenda 21 and forces you to live in a flat in Nob Hill or Manhattan. When is the next chance, if any, to formally modify this 35-year plan? It is updated every 5 years. Haha, can’t wait for the people in gray to force me into my oppressively charming Park Slope flat. Also the quote in paragraph five is further off the deep-end than I’ve seen in a long, long while. Did they choose to not see the irony? Tea Partiers are so used to labeling anyone who disagrees with them as “UnAmerican,” that they can’t wrap their minds around the majority of their fellow citizens wanting a different way of life. So it must be a sinister foreign plot. From the NBC Segment – “locate the housing near transportation to reduce greenhouse gas emissions”, then transition a clip of a freeway????? I couldn’t help but think that NBC got the story completely wrong. ABAG is grossly mischaracterized by many urbanists (a group of which I consider myself a part of). ABAG is a pro-growth development agenda sponsored by the real estate industry. If it were about “sustainability,” there would not be a provision to mandate that the rural counties build more housing. Why is ABAG imposing yet more sprawl on the Bay Area? As a SF resident, I say keep all development in the urban cores of SF, OAK, SJ, and the east bay shoreline from OAK to SJ. Do not build SMART or any of the proposed high-density stuff in Marin, Napa, Sonoma, Mendocino, Santa Cruz, etc. They were not rallying against high-density development. They were against increased sprawl into what is currently an idyllic wilderness and farm belt relatively short bike or ferry ride away from SF. After Plan Bay Area gets implemented, everyone in SF will need to buy a car if they want to escape fom the city. Sonoma County might be primarily rural but Santa Rosa is not even remotely rural, it’s a city of over 200,000 people. Up to you. We can build more housing up in the Mayacamas, and subdivisions on vacant land outside Windsor, or we can build more density into Santa Rosa. The recent trend has seen Windsor and Healdsburg annexing land and extending their footprint despite empty lots (or decaying buildings) inside the center of town. A core tenet of ABAG is to insist that every county provide for hundreds of thousands of additional housing units, “to accommodate fo the need for workers in the future.” This need is being fueled by ABAG pro-growth policies. Keep growth in the cities. Urban infill is one thing. Forcing the building of thousands of housing units in order to receive a county’s fair share of California tax revenues is developer-sponsored blackmail. Farhad Manjoo said it well in December last year. San Francisco is to blame for the low desnity development here. We should focus on SF before promoting development in the boonies, in the style of the dreadful Inland Empire. I prefer Brooklyn. As part of the Bike Lobby (An All-Powerful Enterprise), surely I could use my sway to have Obama relocate me to the Heights. It’ll be so much nicer once we tear down the BQE. This doesn’t make a lot of sense..what do they do now to escape the city? BART and MUNI don’t go to the idyllic wilderness. As Murphstaho said, Santa Rosa is already a city. 101 is a clusterf**k already around there. You guys can’t just point at SF as having problems, YOU have sprawl problems that you’re choosing to ignore. It’s an old tradition of letting sprawl happen through lack of planning, starting with rejecting BART 40 years ago. Don’t know which “you guys” you are referring too, but as an SF resident, I like being able to ride a bike up the 1 or along the frontage roads of 101 to get to the backroads of Marin for rolling hill speed rides without much auto traffic. Imposing massive development on Marin, Sonoma, San Mateo, Santa Cruz, etc, will cause these roads to be severely impacted and force me to drive half-way to Oregon to access roads that are good for bike riding. False choice. Dos not have to be development in either place. Only ones calling for further development is ABAG, public sector unions that want to increase spending on public pensions, and the Realtor lobby. The RHNA process doesn’t do any favors given that it assigns units by jurisdiction, no matter the size. ABAG doesn’t assign Noe Valley housing units, but it assigns them to Ross, even though both serve similar purposes within their county. I’d love to see urban infill in San Francisco, but I’d also like to see infill in San Rafael, Corte Madera, Petaluma, Napa, etc. Some of areas are so far from the City that they serve as secondary or tertiary cores for their region. San Rafael’s population grows more during the day than San Francisco’s, proportionally speaking. A good chunk of SMART’s projected ridership will go to Santa Rosa, not just San Rafael or Larkspur. Napa and Fairfield are similarly the employment centers of their respective counties. If those outlying regions are going to grow, they need to grow there, and ABAG is incentivizing that. The (not so) funny thing is, without further development the only places young people, singles, and the poor in general will be able to live is in rented rooms. These relatively affluent homeowners are so afraid of “stack and pack” housing – yet a lack of development will force LOTS of people to live “stacked and packed” in rented rooms, when they could be living in a highrise apartment if we’re not afraid to build them. People are coming here like it or not – we need to build for it. It is the premise that there needs to be growth to satisfy government quotas is what disturbs many people. I would rather see population shrinkage north of the GGBridge. That could easily be done through a combination of zoning, land trust incentives, and satisfying the existing public will. million instead of the current figure at 880,000. Does this imply lots more sexytimes and babies and fewer of the abortion thingies? Or that those counties would have grown instead of some other place? Where do you propose the human beings go? Or do you expect that the prevalence of 1 year old children to mirror zoning changes? San Francisco has a population density of about 6,200 people per km2. This is only one-third of Paris and other more livable cities. Oakland is a paltry 2,700 ppl/km2. SF & OAK can easily add 4 million more residents, with a resulting increase of standard of living. Young people more and more want to live in vibrant cities anyhow. Why promote sprawl like ABAG wants? yes. You are sacrificing San Francisco’s potential to become a great city by depriving it of residents who live within its boundaries, and depriving its existing and future residents from easy access to nature. I thought that most StreetsBlog readers would understand the concept of building up and/or building smarter, not sprawling outward. Santa Rosa is a big town. It has a lot of industry that is specific to Sonoma County. If we only grow in San Francisco, those industries will either be understaffed or require people to commute to it from San Francisco, under your theories. Unless you think we should be moving bulk wine production facilities and distribution into San Francisco? Maybe we can move all major dairy processing companies in Petaluma to the Outer Sunset? And all the people running the tasting rooms in Healdsburg can just hop on the GGT #80 every morning at 7th/Market and then switch to Sonoma County Transit? Not sure how all the people in the restaurant industry will get home after their places close? These “netherlands” you seem to be so well versed in are vibrant economies supporting large workforces. We can either make the current towns in those counties more dense, or we can keep on building larger lots. bicycle? Ferry? Bus? Muni rail doesn’t even allow bikes onboard, and BART only started allowing them about 3 weeks ago. If you promote yet more sprawl into Mill Valley, Corte Madera, Larkspur, San Rafael, Novato, Sonoma, etc, then I will need to ride 200 miles along the freeway before finally reaching the end of sprawl and an enjoyable bike ride. NO THANKS! So really your argument comes down to, you don’t want people moving to Marin and Sonoma because it will cause congestion? That’s classic NIMBYism. Clearly your definition of sprawl is not the one understood by most people. ‘Sprawl’ is usually defined as expending the boundaries of an urban area by creating new development on farmland. What you are describing as ‘sprawl’ is a plan to increase density on already developed land in the core of peripheral cities in the region. Not the same thing. A city like Santa Rosa is going to grow independently of what happens in SF, the question is whether it grows outwards or upwards. Annnnd people who’d like to live in the bay for less than three grand a month? I just rented a 650sqft market-rate apartment in SF for $1600 per month in Potrero Hill. You can go to Oakland, San Pablo, or even Bayview and get a 3-bedroom for well under $2,000. What is wrong with renting? Renting is economically smarter from now until interest rates peak again, probably not for another 5-15 years. Someone should have brought a camcorder and recorded the looniest of the tea-party people. The best way to discredit them is just to show them being themselves. Sounds like you need to take a few deep breaths and re-read some of the comments you’re hastily decrying. I think what josh is referring to is many people living in converted houses, potentially illegally and unsafely because there is a lack of apartments or denser housing designed to accommodate lots of people. So people decrying apartment buildings and condos, potentially end up with much worse conditions as houses designed for 1 family end up being rented by several. His comment wasn’t against renting in general. I think @Sanfordia113:disqus needs to take a few deep breaths in general. By your comments here that will be an off-road ride, because clearly we should stop maintaining roads outside of San Francisco County as anything outside of that is simply sprawl inducing and wasting precious tax dollars that could be spent on San Francisco’s infrastructure so that SF can reach its full potential! Yeah, that’s probably what people like you thought about the Declaration of Independence…. The problem is all this WE crap. Its not your land. San Francisco has the second-highest population density in the nation. It is not deprived of residents. It is inaccurate to claim that BART only started allowing bicycles this past summer. With limited restrictions at commute times, BART has allowed bicycles for decades. Fold-up bikes were welcome at any time. Sprawl is not being promoted by Plan Bay Area. Marginally denser and infill development along existing corridors is. The Bay Area’s wonderful abundance of open space, accessible by bicycle (or often bus and sometimes rail), will remain largely unchanged for decades or centuries to come – especially if more new housing is built in already established communities. Encouraging new housing to be built in established communities will help to reduce further suburban sprawl. Yesterday the California Transportation Commission approved 62 projects for a total of $103.3 million from the Active Transportation Program. The projects were submitted by the Bay Area, Fresno, Sacramento, San Diego, Southern California, Stanislaus, Tulare, and Kern regional governments.